When you’re trading the market, you need to understand that it goes through wild swings at times. Well, if you don’t already know, there’s an index that tracks the volatility – the percentage movements – of the S&P 500 Index. Basically, the CBOE Volatility Index ($VIX) provides market participants with the overall outlook of how volatile the market will be within the next 30 days. 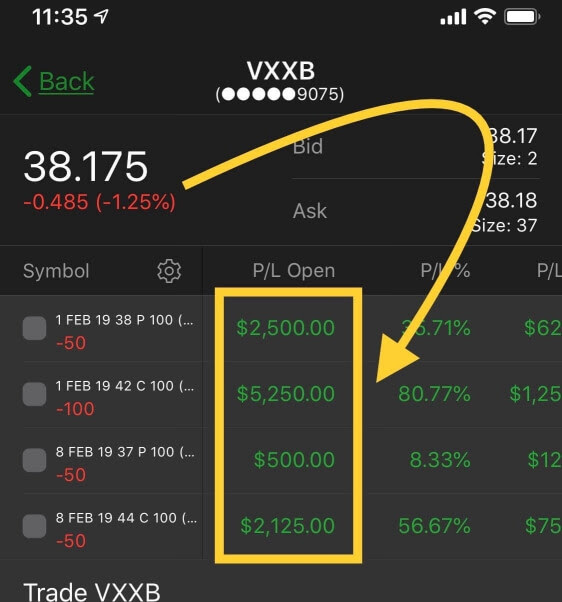 Now, there are some questions I get asked all the time, like, “When should I look to short something that ‘looks’ overbought?” and “How do I trade the VIX?” That said, let’s take a look at the VIX and how you can trade the market just by following this index and understanding a simple… yet powerful chart pattern. Now, the fastest money can come from shorting stocks because when stocks drop… they tend to plummet quickly. However, the problem is the fact they don’t fall often. But how do you know when it’s a good time to look to get short… or shift your sentiment from bullish to bearish? 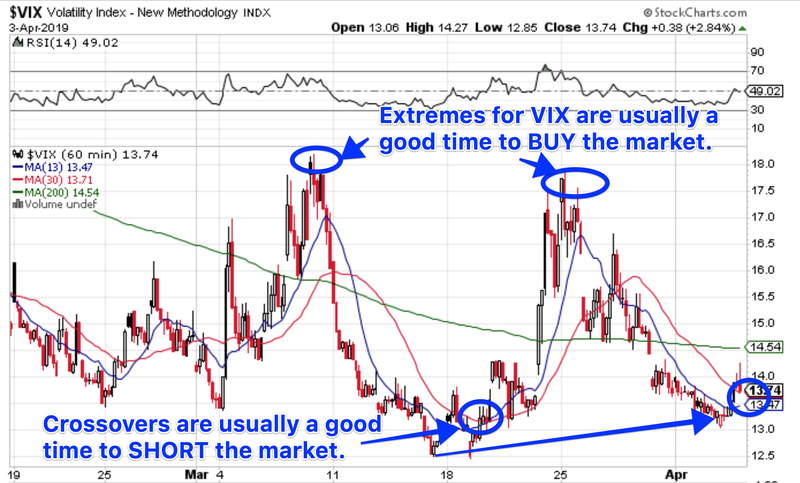 One tool in my arsenal is look at the $VIX chart in relation to the overall market. In this case, we look at the SPDR S&P 500 ETF (SPY) as the “market”. Basically, the VIX produces a measure of constant, 30-day expected volatility the S&P 500 Index call and put options. 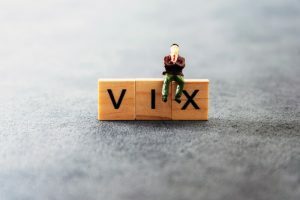 Now, the VIX – also known as the “fear gauge” for SPY – gives us an idea of how much of a premium traders are willing to place on puts in the market. If traders aren’t buying puts… then there is no fear of a pullback, right? On the other hand, when people fear the market could collapse or correct… then traders will buy puts. In turn, this would cause the CBOE Volatility Index to rise. Keep in mind, you can’t directly buy the VIX since it’s an index. 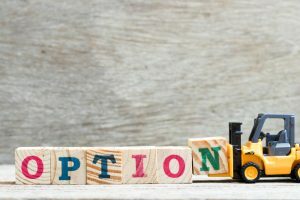 However, you can trade exchange traded notes, like VXXB, UVXY, and SVXY… or VIX options and futures. Moving on. Let’s take a look at how we could use the VIX and the SPY to signal when to get short stocks. Here’s a look at a simple chart on the VIX. If you look at the hourly chart in the VIX above, you’ll notice that when the VIX is at extreme points… it’s a good spot to look for strategic longs in the market. In other words, since traders are paying such a premium for put options… it’s very easy for those traders to take profits… causing those options to lose value. On the other hand, what happens if you’re actually looking to short the market, or think volatility will pick up? Well, you can clearly see when the blue line (the 13-hourly simple moving average) crosses above the red line (30-hourly SMA) – the money pattern… it’s a good spot to look to buy volatility, or short stocks. Now, here’s a look at some results just by knowing these simple factors about the VIX. Now, I’m not just looking at the VIX… I’m also look at the same timeframe on the SPY. Here’s a look at the VIX hourly chart again. Compare that to the same timeframe on the SPY. Look at the two charts closely. Notice on March 11, the VIX topped out… while the SPY bottomed out. These were extreme points, and made it a good place to start taking a gamble on a potential reversal. It actually worked out quite well just two weeks after that. When was the time to short the rally after that? 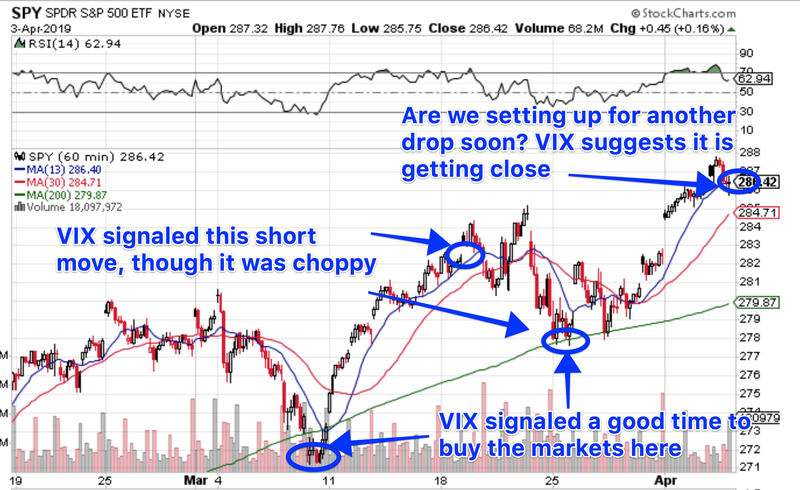 Well, on March 20, you can see the VIX signaled it had the potential to rise… while the SPY was trading choppy. Basically, the VIX looked like it was signaling a bottom again. However, that signal led the SPY to reach the 200-hourly simple moving average (SMA) – the green line in the chart above – on March 25. Well… guess what happened there? The VIX topped out again at that time. That signaled it was time to go long the market, or buy call options. That worked again. Was it magic or just luck? I think it’s quite clear that the money pattern and comparing the VIX and the SPY have proven to be a profitable strategy. Does this mean the market can’t go higher from here? Not necessarily. To me, this is the kind of space where I may look to build short positions in stocks that you think have the most downside potential. 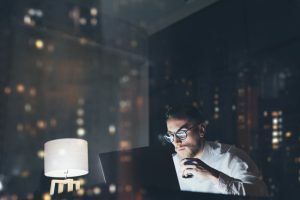 As always, make sure you conduct your due diligence… and make sure you understand SPY, VIX, or VXXB options before you go out and start trading those products.